Hunger continues to spread, lines keep growing and the situation in Venezuela is clearly there to stay. Over the past few years, the world has witnessed Venezuela's worst economic crisis in history reek havoc on the country and its people. President of Venezuela and leader of United Socialist Party of Venezuela (PSUV) Nicolás Maduro took over after Hugo Chavez' death three years ago and has faced economic instability due to the decrease in oil prices and mismanagement of government. Maduro blames big corporations from the U.S. for the crisis. In actuality the fault lies with Maduro's government. In response to the lack in access to international capital, the Maduro government has been printing more and more money. This fuels massive inflation. In just one year, the price to feed a family of five has gone up 524 percent. This economic crisis includes food and medicine shortages, electricity restrictions and rare basic necessities. All of these bring riots and violence to the Latin American country. 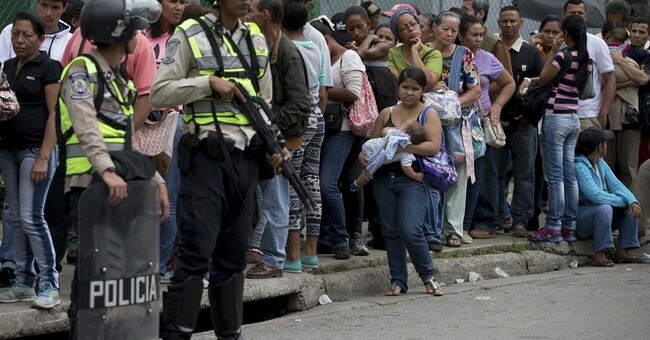 The people of Venezuela are forced to wait in long lines in front of state-run supermarkets to get food and basic needs. This trend occurs because of the decreased imports of products into the country. The spokesman of the NGO recalled that 1,200 protests were reported in 2015 by food. And the State's response has been the use of public force and repression. According to Transparency International, Venezuela is the ninth most corrupt country in the world. The government tried to fix the problem by implementing price floors that just caused all products to disappear to the black market. Because this problem is not going away, the government has been dipping into its gold reserves to pay off their international debt. When those run out, imports will decrease even more and possibly end entirely. There is one ray of hope for the Venezuelans. Gardens supplying fruits and vegetables have helped some of the starving families hurt by the crisis. While it still is not enough, it is something positive. This is no indicator of a brighter future. There's still nonstop spreading hunger and long lines. These indicate that the dire situation in Venezuela has no near end in sight.